Very little info about this computer which came from Czerweny Electr�nica in Argentina. The company also supplied parts (transformers, fans...) to numerous computer factories in the world. 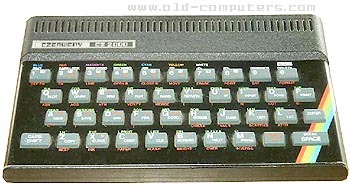 The CZ-2000 was a pure Sinclair Spectrum compatible system. The motherboard (Issue 4) was imported from Sinclair branch in Portugal. In Argentina Czerweny models competed with Brazilians TK 83, 85, 90x and genuine Sinclair machines, but CZ sold more machines than them. The color output was compatible with the local video standard (PAL-N), feature that the genuine Sinclair (PAL-B) and the Brazilians TK did not have. That was an advantage over these. Eventhough in those times many people could not afford an extra color TV for the computer the difference was still important because a PAL-N signal produces a sharper/clearer image on a B/W TV than a NTSC or PAL B signal. see more Czerweny CZ-2000 Ebay auctions !